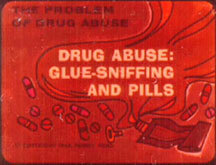 If you think drug advisories are square and irritating now, then you’ll love this 1970s filmstrip about pills and glue-sniffing. Even though the audio isn’t authentic, the message hasn’t changed: You can’t go anywhere without someone throwing drugs in your face to get you high, and model plane assembly is the stuff of doped-up nerds who are still too lame for most other drug addicts. Meanwhile, this thing’s visuals will make you think you’re on drugs, as they’re done in that weird, reddish monochrome that looks like old magic marker (which you could probably also sniff to get high). But at least the new narrator comps to being a lousy doctor who’s baffled by his own stethoscope. And the surprising versatility of the phrase “Damn you, school! Look what you made me do!” keeps this filmstrip relevant in a more sophisticated drug culture.